A little bit louder now...: You look like a terrorist, and you smell like one too! You look like a terrorist, and you smell like one too! I use to have this job, designing news graphics. I wonder if people scrutinized my work the same way. LOL. Makes me laugh at some of the decisions that I probably made while I worked for Chanel 2. Like the time that I posted a picture of Omar Sharif, the actor, and the story was about Sharif Omar, the terrorist. 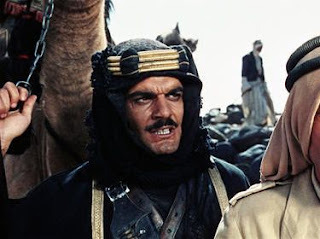 In half of his movies he is in the desert wearing a Turban and I am no connoisseur of the golden age of film. The director and everyone else on the dance floor (err, news room floor) was freaking out, telling me the station could be sued for at least 2 million dollars. In retrospect I should have been making far more money if I had the ability to make 2 million dollar mistakes. I hope my next job will pay me 2 million dollars. As a signing bonus, preferably. I almost shot my energy drink out my nose when I read this. I don't know why Channel 2 freaked out. Fox news does it all the time. They have talked about Obama while showing a picture of Osama and then claimed it was a total mistake. One day, when you get sued, I'll represent you. maybe I could sue you and then kathleen could represent me too, but instead of going to court, we'll all just go to the beach. omgosh...i justwatched the chelsea episode of her planning the funeral...or maybe it was added on to this new episode. it was soo funny-- when she got her make up done. reminded me of drop dead gorgeous...when kirsten dunst says " i didn't want her to meet her maker, looking like a cheap whore" haha h hope you've had a good one! ily!